As expected, the Twins exercised their $5.25 million team option on Jason Kubel for next year. He wasn't worth that salary this season, hitting just .249/.323/.427 in 582 plate appearances for career-lows in batting average, on-base percentage, and slugging percentage, but Kubel is a strong bet to bounce back at least somewhat at age 29 and duplicating his .271/.335/.463 career line in 2011 would make him worth more or less that money. Kubel's poor defense and inability to hit left-handed pitching severely limit his value, and while his overall production is solid it's not particularly difficult to find solid-hitting designated hitters and corner outfielders in that price range. Retaining him for only a one-year commitment, even as perhaps a slight over-pay, was probably pretty close to a no-brainer for the Twins, but his presence could complicate things a bit in terms of potentially re-signing Jim Thome. Justin Morneau missing the final three months of the season meant Kubel and Thome were in the lineup together, but if Morneau is healthy and starting every game that would leave one of Kubel, Thome, Michael Cuddyer, or Delmon Young on the bench. A simple solution would be sitting Kubel or Thome versus lefties and Cuddyer for righties, but in the past Ron Gardenhire has been unwilling to platoon Kubel or Cuddyer and they'll combine to get $16 million in 2011. In tandem with picking up their $5.25 million option on Kubel the Twins declined their $5 million option on Nick Punto, choosing a $500,000 buyout instead. 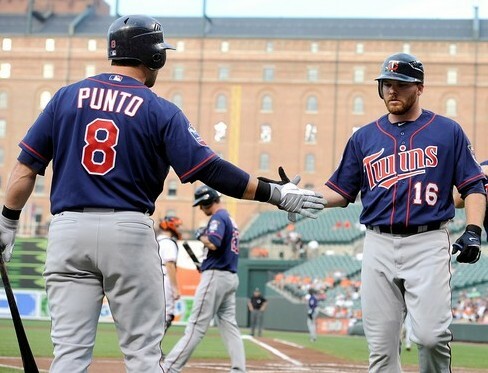 Normally not paying $5 million for a 33-year-old utility infielder with a good glove and awful bat should be a no-brainer, but there aren't no-brainers with Punto and the Twins. They paid him $4 million in each of the past two years and have given him an average of 434 plate appearances per season since 2005. In other words, don't be surprised if they attempt to re-sign him at a lesser price. And doing so wouldn't necessarily be a bad move. When he's making $4 million and coming to the plate 434 times having Punto around is a mistake, but for, say, $1 million and 150 plate appearances he would be a perfectly reasonable bench player. For now Matt Tolbert is penciled into the utility infielder role for about $350,000, but Punto is a comparable hitter and a better defender. Punto came to the Twins along with Carlos Silva and Bobby Korecky in the December of 2003 trade that sent Eric Milton to the Phillies. Since that deal Punto has 2,707 plate appearances, which is fourth-most on the Twins behind only Morneau, Cuddyer, and Joe Mauer. And across baseball Punto is also one of just two players since 2004 to bat at least 2,700 times and post an OPS below .650, with the other being Cesar Izturis.